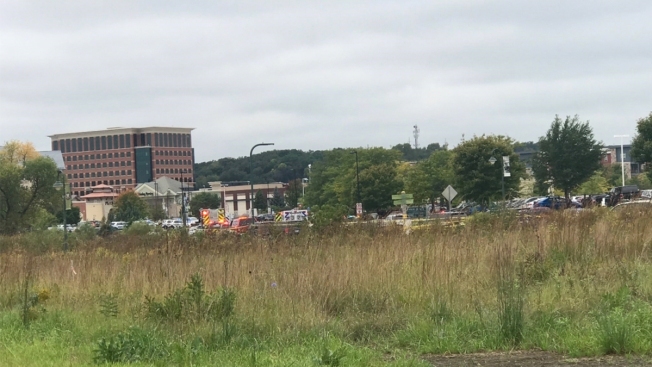 This Sept. 19, 2018, photo shows authorities responding to the scene of a shooting at WTS Paradigm in Middleton, Wisconsin. A Wisconsin software worker who opened fire on his fellow employees in their suburban Madison office had worked for the company for almost 18 months and had no criminal history in the state, authorities said Thursday. Police killed the gunman in a shoot-out Wednesday morning inside WTS Paradigm's Middleton offices while responding to reports of an active shooter. The Dane County medical examiner identified the shooter Thursday as 43-year-old Anthony Tong. Police said three people were seriously wounded in the attack and remained hospitalized Thursday. A fourth person was grazed but a bullet. Middleton Police Chief Chuck Foulke said the gunman had worked at WTS Paradigm since April 2017. Foulke said he had no criminal history in Wisconsin and lived alone. Officers searched Tong's house in nearby Verona Wednesday evening, but Foulke didn't say what they found. The chief said investigators still don't know what prompted the attack . "I'm dying to know the motive also," Foulke said during a Thursday news conference. "We just have not found one yet." One victim was critically wounded but had been upgraded to serious condition by Thursday morning, while the two other victims remained in serious condition at University Hospital, according to a spokeswoman. Foulke said investigators had interviewed two of those victims. He did not say what they divulged but called the conversations "really important interviews." The victims' names haven't been released. WTS Paradigm officials issued a statement Wednesday saying the incident was shocking and heartbreaking, but the company provided no information about the shooting. A company spokesman didn't reply to emails Thursday. Officers were called to WTS Paradigm in Middleton, a Madison suburb of about 17,440 people, just before 10:30 Wednesday. Foulke said officers arrived within 8 minutes of receiving emergency calls and found a man wielding a semiautomatic pistol. Foulke said the man was carrying extra magazines as well. Two Middleton officers and two Dane County sheriff's deputies exchanged gunfire with Tong, killing him. The officers and deputies were not hurt, Foulke said. The police chief said he didn't know if the victims were targeted or shot at random. He added that federal authorities are tracing the history of the pistol to determine how the gunman's acquired it. Just a day later across the county, multiple people were killed in a shooting at a Rite Aid distribution center in Maryland.